Wow! What an amazing week! 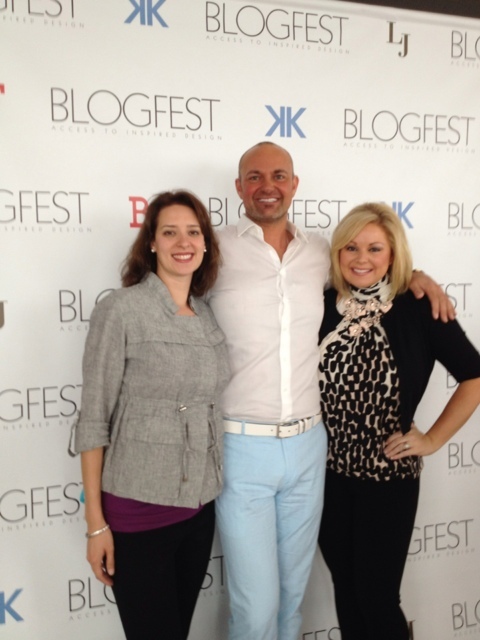 I had such a blast at Kravet’s Blogfest2012! I’m already ready for next year! I’m not sure how they’ll ever top all of the fun we had. In case you missed it, I recapped all of the excitement yesterday on Good Morning Texas. I was very excited to have 2 fellow IBB designers along for the ride – Brandy Scott & James “JT” Turner. 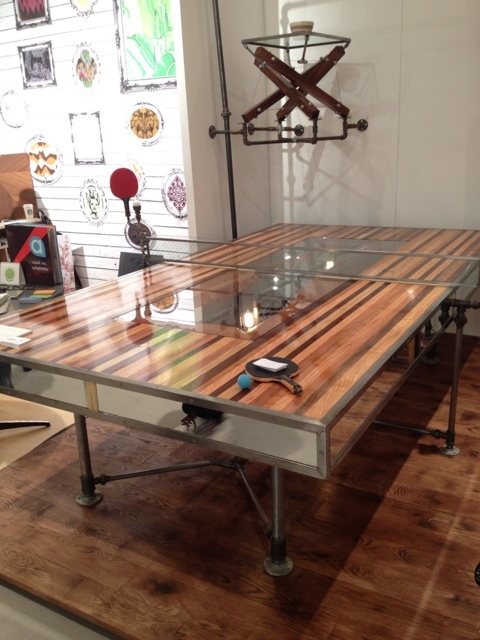 We kicked off the festivities by perusing ICFF and came across this insanely cool ping pong table by Akke Functional Art. 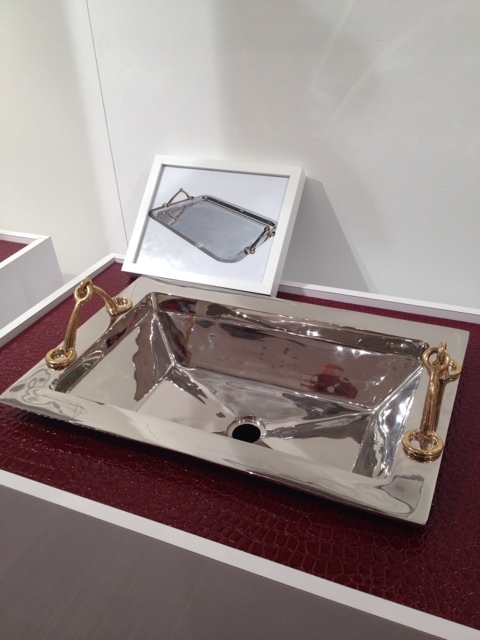 This Hermes inspired sink from Linkasink really caught my eye. I think it would be such an elegant addition to a powder bath! Next stop was the Kips Bay Show house benefiting the Boys & Girl’s club. 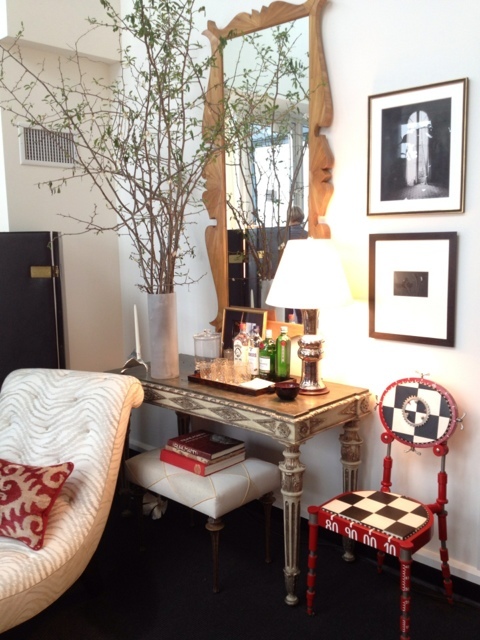 It was a scrumptious feast for the eyes with incredible rooms by notable designers like Alexa Hampton & Thom Filicia. 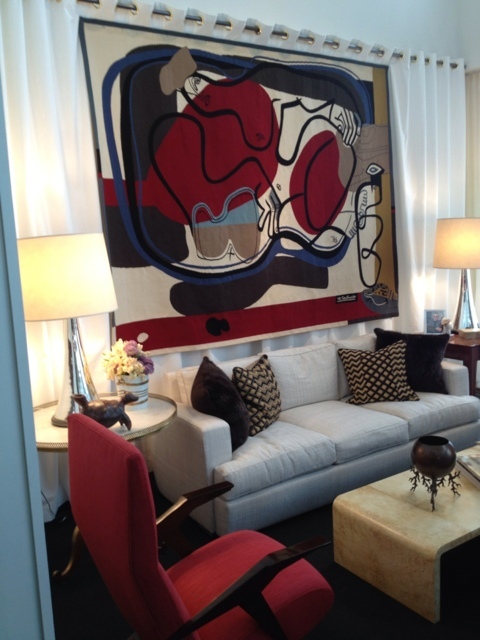 One of my favorite rooms featured this stunning tapestry over the sofa. Alexa Hampton’s bedroom featured richly lacquered walls in “Dragon’s Breath”. 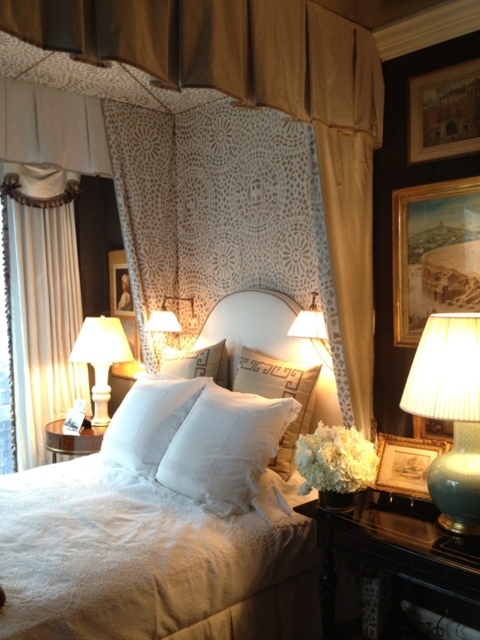 The bed was dressed with fabrics from her personal collection with Kravet. 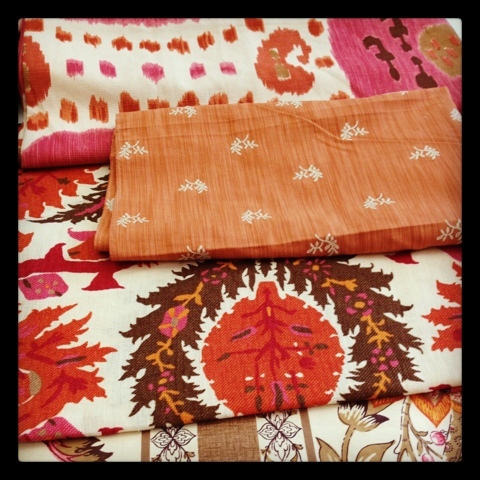 I was very excited to see the suzani inspired fabric since we’re getting ready to use it in a client’s dining room. This chair was so remarkable in person. The contrasting welt cord was the exact shade of the deep bluish purple walls. The apple green silk paired with the creamy white finish and gold leafing was so fresh and made a beautiful statement in the dining room. This layered vignette was so well pulled together. I think almost every blogger stopped to photograph it. 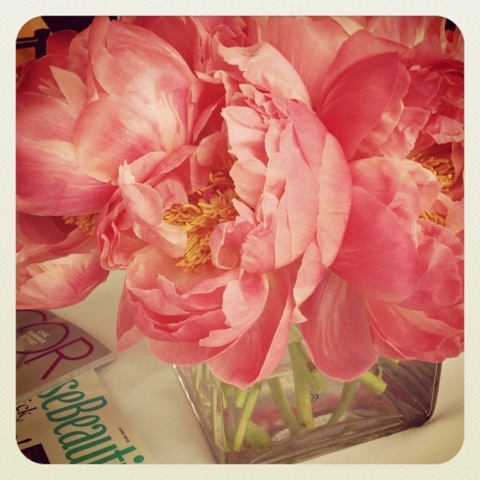 The weather may have been yucky on Tuesday morning, but we were cheerfully welcomed by these gorgeous pink peonies at Hearst Tower. We were treated to a behind the scenes look at what goes into publishing House Beautiful, Veranda & Elle Decor. 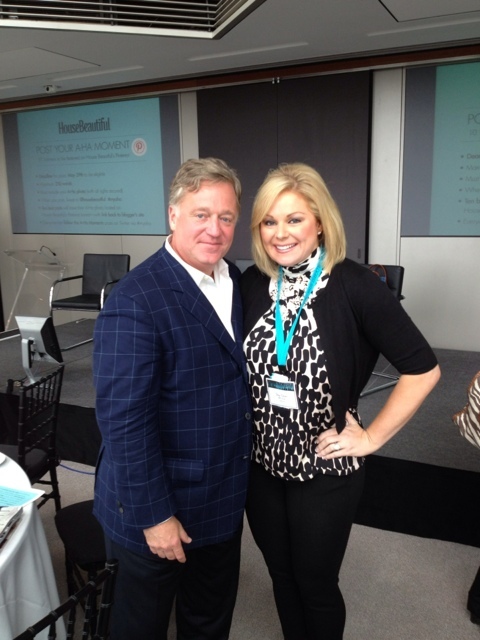 It was such a pleasure to chat with House Beautiful’s editor, Newell Turner. He was so warm & gracious. Newell and the staff at House Beautiful have embraced the digital world and are steering the magazine to become an interactive experience that the reader can enjoy far past the printed pages. They also fully support the blogging world and have realized the benefits of taking cues from design bloggers. The next stop on our tour was the Elle Decor Modern Life Concept House. My favorite space was designed by Michael Tovano. 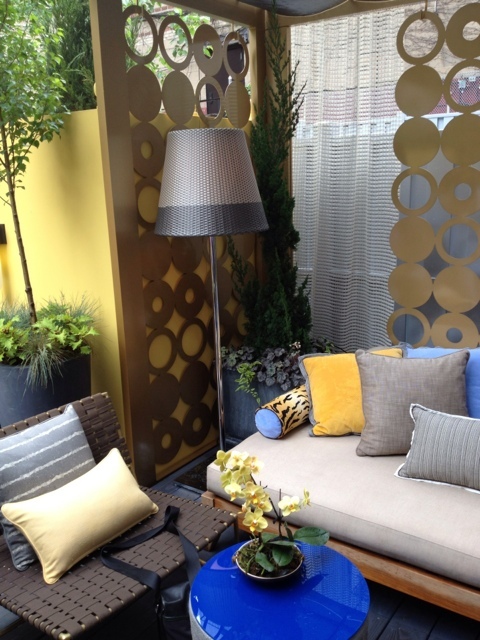 The outdoor space was tres chic! We all gushed over the patterned metal cabana. We spent some time at the D&D building for much more eye candy & inspiration. 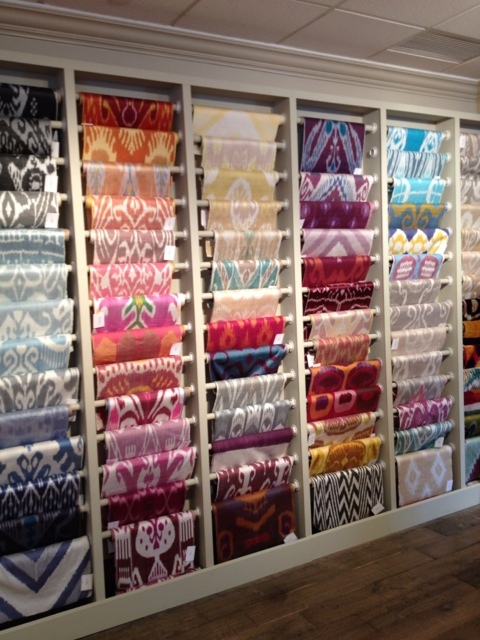 This wall of ikat fabrics at Brunschwig & Fils caught my eye. They offer a wonderful selection of richly saturated & fresh colors in ikat prints and many more timeless classics they are so well known for. We ended the day with a cocktail party at GE Monogram. I honestly had no idea about the detailed customization they offered. 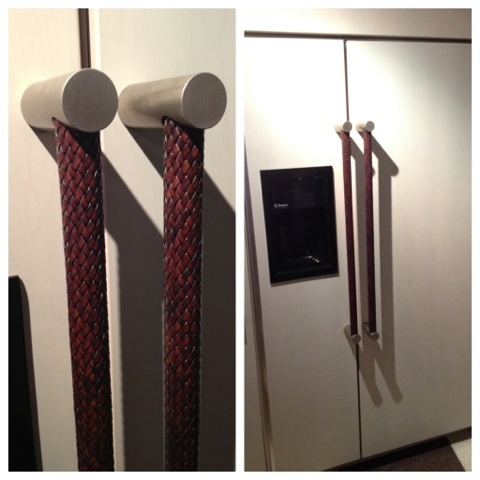 One of my favorite things showcased there was these braided leather refrigerator handles. Such a fabulous detail! 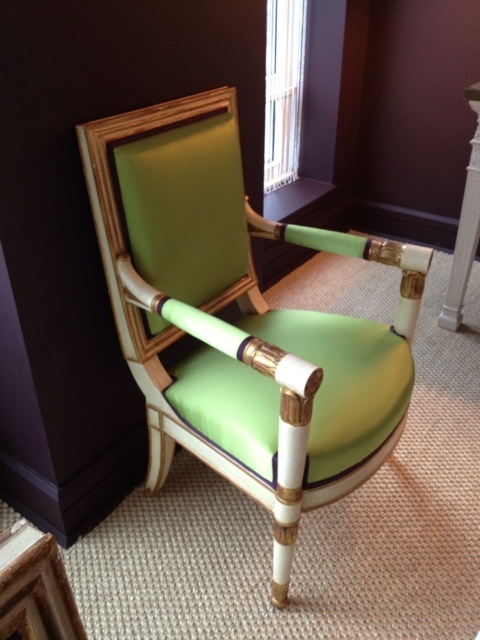 On Wednesday, we enjoyed an exclusive tour of the Kravet studios. I’ve done this tour a few times before, but it’s always a treat because you get a sneak peek at all of the fabulous fabrics they’re designing. Look what I spotted at Lee Jofa! It’s coming out soon! During our trip, we were introduced to a very neat company called GlassyBaby. Created by 3 time cancer survivor, Lee Rhodes, they make artisan hand blown glass votives in an array of gorgeous colors. “To Lee, they represented “that deep breath that we often forget to take.” I was very excited to take home one of the turquoise votives. My apologies to founder Lee Rhodes & glassybaby. I mistakenly referred to them as “GlassBaby” instead of glassybaby on Good Morning Texas. 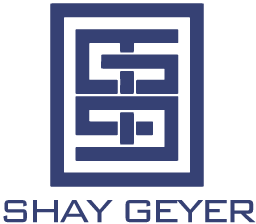 Please make sure to check out this wonderful company. Not only do they make beautiful votives, they have also given back over $850,000 to charities to date. There’s so much more to share with you! Stay tuned for more photos & details on each of the amazing experiences we had during Blogfest2012.